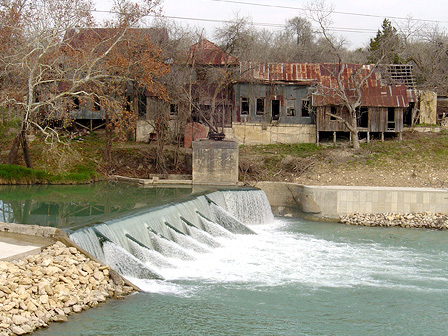 The historic Zedler Mill site represents Texas’ industrial heritage. Located on the banks of the San Marcos River, this architectural treasure was built in 1874 and originally included a sawmill, a gristmill, and a cotton gin. Today the Zedler Mill complex consists of the 1900 Fritz Zedler home and seven other structures on nine acres. Architectural features include wooden feed shutes, wooden pulleys, massive beams, two-story internal grain bins, and belt-and-cup type grain elevators. All machinery was driven by waterpower from Leffel water wheels. The Luling Economic Development Corporation purchased the complex for the City of Luling in 2002. The site is endangered due to years of neglect. UPDATE: In 2007 the Zedler Mill Foundation was established to restore the site. The Foundation raised $1.5 million to complete the restoration, and today the complex is operated as an events venue and museum.